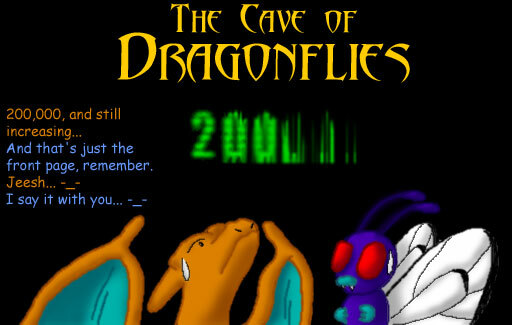 The Cave of Dragonflies has four mascot characters. Back when I had a splash page, they would star on it, and they are still featured on some other parts of the site. 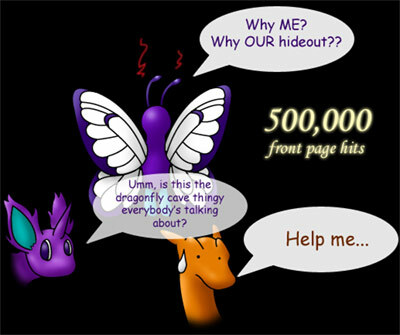 The splash pages vaguely told a story about the site's mascots and the eponymous cave of dragonflies. The first two were animations with dialogue (you can see a transcript of the dialogue here), so that's where the bulk of the backstory comes from, but the static image splashes that followed expanded a bit upon what followed. I was twelve or thirteen when I made those first two, so don't expect this to be particularly thought-out or sensible. 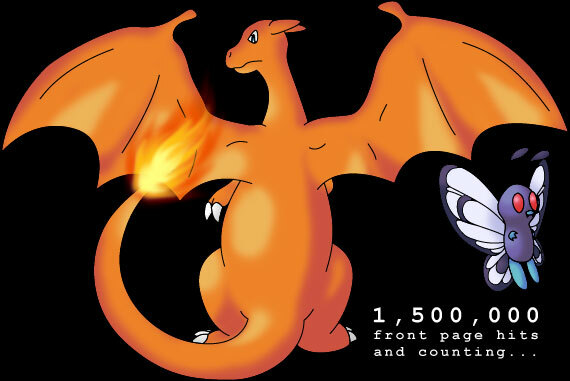 Once upon a time, a Charmeleon, a Metapod and a Scyther were friends, wandering the world together. 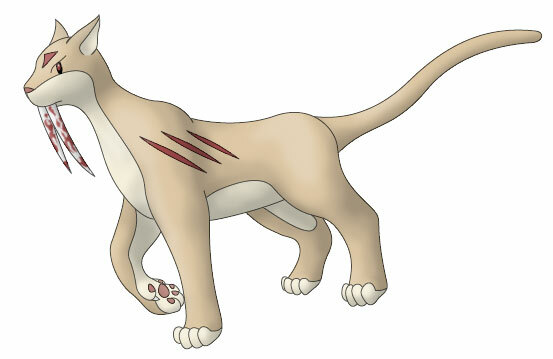 One day, a hungry Fangcat (a kind of silly fake Pokémon that I made when I was twelve) happened upon them, and they would have been its dinner if Scyther hadn't heroically turned to fight it while Charmeleon fled with Metapod and hid in a nearby cave. After a vicious fight, Fangcat killed Scyther and stalked towards the cave, but their fear and the shock of seeing their friend murdered gave Charmeleon and Metapod the sudden strength to evolve and fend the Fangcat off together. 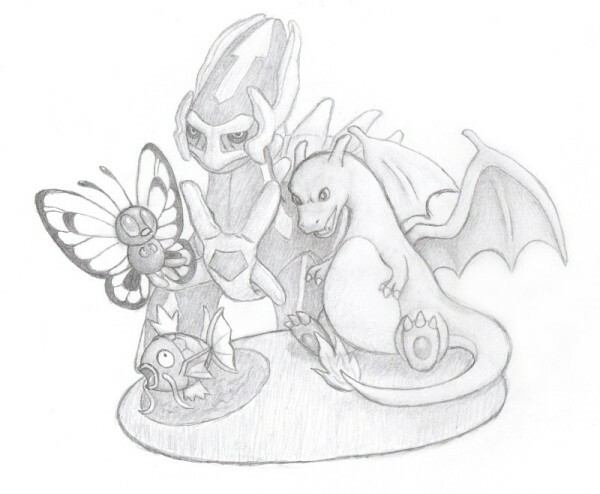 Charizard and Butterfree took up residence in the cave, and one way or another more bug- and dragon-like Pokémon began to gather there to stay, too. One day a human stumbled upon the cave, and Charizard, standing guard by the entrance, stopped it and called Butterfree for help. 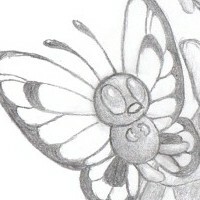 Butterfree, the cave's unofficial leader at this point, judged that they might as well let it in and show it around. 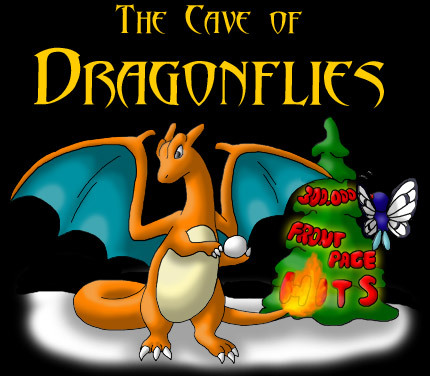 After this, however, the location of the cave began to spread through word of mouth; more and more humans visited the cave, Charizard and Butterfree realized with dread that they'd truly opened Pandora's box, and ever since they have had to live with a constant stream of humans congregating in the cave en masse. 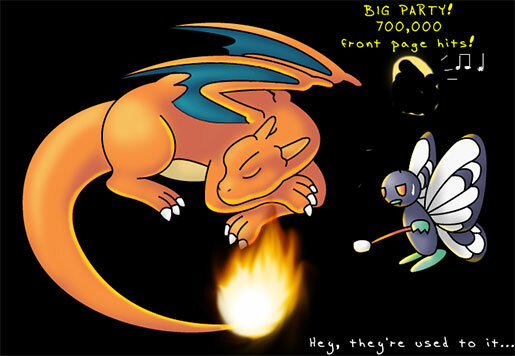 While initially distrustful towards the invading humans, Charizard has slowly grown to accept them and their new lot in life - ironically unlike Butterfree, whose stance evolved in quite the opposite direction. 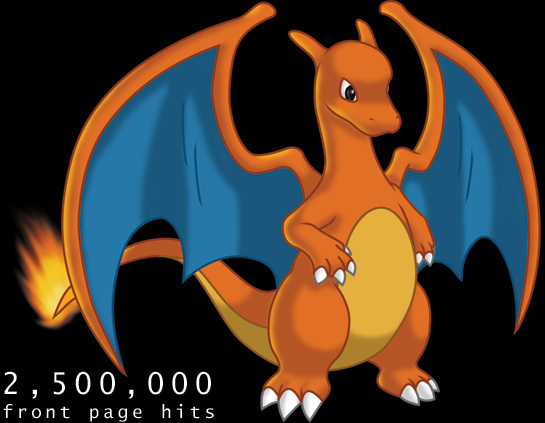 Defying the loud, aggressive stereotype of Charizard, he tends to be quiet and calm and has a playful sense of humour, usually deployed against his longtime friend Butterfree. 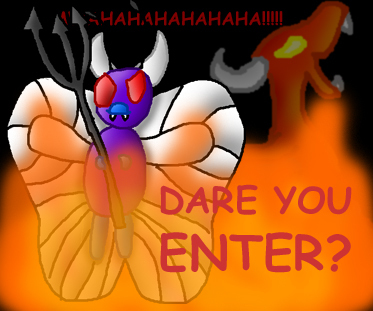 Butterfree was originally the one who insisted that humans were harmless and might as well be let into the cave, but has regretted it ever since. Perhaps exactly because she feels responsible for it, she has developed into the cave's most ardent human-hater - although secretly she kind of loves attention and is a little excited about all those huge numbers on the hit counter. 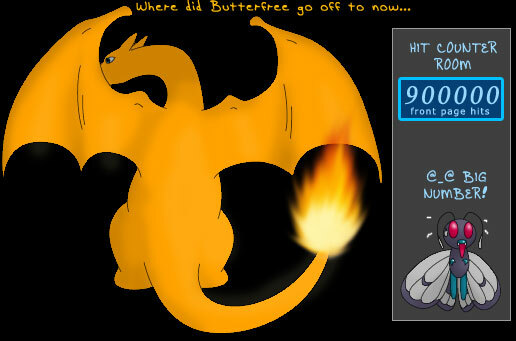 At one point Butterfree ran off with a wandering Nidoking, but this species-defying fling seems to have had a quiet end. 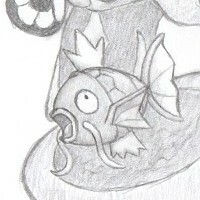 The cave is full of dragonlike Pokémon, including the Magikarp/Gyarados evolution line, and Magikarp was originally simply one of them. 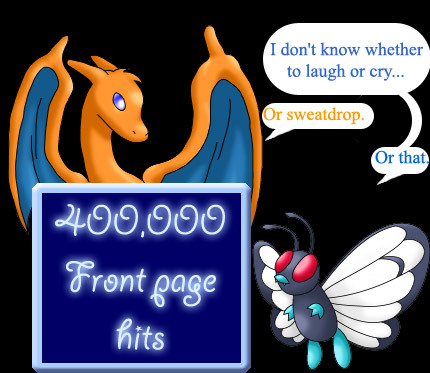 After Charizard and Butterfree officially went on leave from the splash page after spending far too long in an out-of-control Halloween bonfire, Magikarp claimed to know all about splashing, only to belatedly find out that what they were talking about involved being stuck on webpage for a few months. 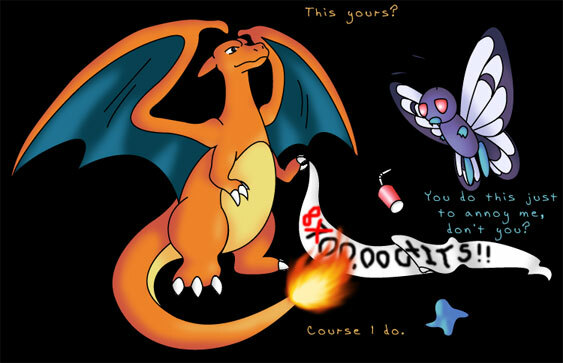 After this incident, he became a favorite for slapping on the splash page when Charizard and Butterfree aren't around, and he takes his job very seriously. I think. Declaring himself the ruler of time, lord of time, time lord, etc. Nobody knows quite where Quentin came from; he just showed up one day, claiming to be a time lord dragon and demanding entry into the Cave of Dragonflies. 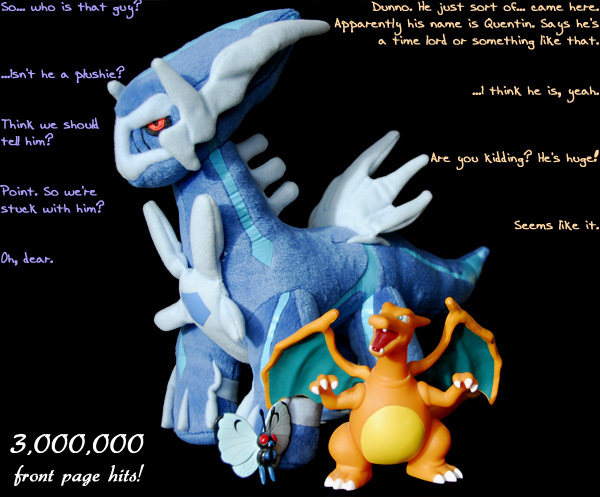 Nobody has yet had the heart to point out to him that he is a giant plushie and not the real Dialga or that he is not quite as imposing as he thinks he is (though his size makes people disinclined to insult him). 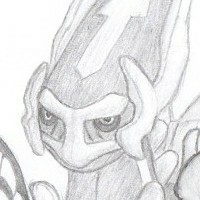 It is unknown if he actually has any of Dialga's powers or what sort of force animated him, and he has shown no intention of flaunting whatever powers he might actually have, so for the moment it remains a mystery. 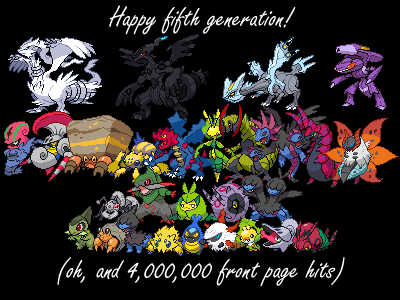 While the site no longer has a splash page, it used to have one that would generally feature the mascots. 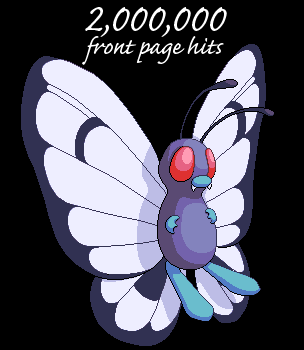 At first they were changed whenever I felt like it, but then I started to make new splashes when milestones in front page hits were reached, up until I retired the splash page. I may one day start doing hit milestone celebrations with the mascots again, but that will not be in the form of a splash page, because splash pages are annoying. The most interesting thing about them may be watching the gradual improvement in my art (excluding the second splash, which consists of resized sprites for God-knows-what reason). 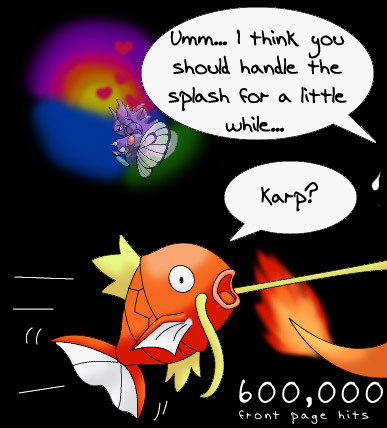 Random fact: All the graphical hit milestone splashes after 300,000 follow a naming pattern of either [number]splash. [extension] or splash[number].[extension]. What's more is that until 3,000,000, they always alternated between the two with each new splash, absolutely unintentionally; each time I made a new splash I forgot which naming scheme I used last, thought it was the other and decided to settle with it, and then forgot it again. 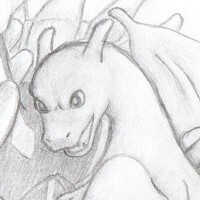 A strange mixture of the Clue Game and a text adventure, Magikarp: the Gathering eventually involves the mysterious disappearance of Magikarp and Charizard and Butterfree's efforts to find him. I hope to one day create some kind of a similar adventure thing revolving around Quentin and his time-traveling abilities, but that doesn't exist yet and is still in the very, very rough planning stages. The gen III/IV catch rate formula and how it works.